Dallas residents who love the thrill of competition and spending time with friends (or even making new ones!) should check out Dallas Sport & Social Club. 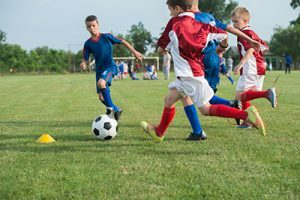 The organization offers an array of recreational sport leagues for those who want to play football, basketball, soccer, and softball, but also has less physically demanding activities like darts and ping pong. Rest. Your first step in overcoming this injury is to stop activities that cause pain. You do not have to completely remain inactive, though! (Actually, it’s better if you don’t.) Switching to low-impact activities like cycling or swimming is wise choice while your Achilles heals. Medication. Naproxen, ibuprofen, and other pain relievers can reduce both the pain and the swelling you are experiencing on account of the injury. Check with our office for specific dosage recommendations. Ice. We may recommend an icing regimen to further alleviate pain and swelling as part of your treatment plan. Remember, always wrap the ice or ice pack in a thin towel to protect your skin. Physical therapy. We will provide you exercises you can perform to help strengthen the calf muscle and place less stress upon the Achilles tendon. Your best practice for Achilles tendinitis treatment is to visit our medical professionals at Dallas Podiatry Works. We will assess your condition and its severity, and then create an effective treatment plan to put the pain in your rearview mirror. For more information on our podiatric services, or assistance scheduling an appointment for either our Dallas or Plano, TX offices, give us a toll-free call at 972.566.7474.